LONDON — One by one, the pubs are disappearing in Hampstead, a jewel-box village of cobbled lanes and Georgian homes that has become one of this city’s most fashionable neighborhoods. The Nags Head has become a realty office. The King of Bohemia is now a clothing shop. The Hare & Hounds has been replaced with an apartment building. Changing economics and shifting tastes have claimed roughly one out of every five pubs during the last two decades in Britain , and things are growing worse. Since the 2008 financial crisis, 7,000 have shut, leaving some small communities confronting unthinkable: life without a “local,” as pubs are known. And that has spurred the government into action. New legislation is letting people petition to have a pub designated an “asset of community value,” a status that provides a degree of protection from demolition and helps community groups buy pubs themselves, rather than seeing them get snatched up by real estate developers eager to convert them for other uses or tear them down. Since the Ivy House, a beloved local in south London, became the first to receive the designation last year, roughly 300 others have followed suit. Still, the traditional pub is being squeezed as never before, even after George Osborne, chancellor of the Exchequer, reversed course last March and reduced the tax paid on every pint of beer, by a penny. Antismoking laws are keeping smokers away. Cut-price beer for sale at supermarkets is eating into business. In London, the upward spiral of real estate prices has made pubs attractive targets for developers. And then there is a cultural shift on this isle of bitter, porter and stout: People in Britain are drinking about 23 percent less beer than a decade ago, according to the British Beer and Pub Association. Pubs have been trying to take up the slack with other beverages and expanded food menus. “Large pub companies own a lot of property, and there’s a temptation to sell some of those properties off for a quick monetary gain,” said Neil Walker of the Campaign for Real Ale, an advocacy group. Many pubs have been turned into residences or supermarkets, he said. 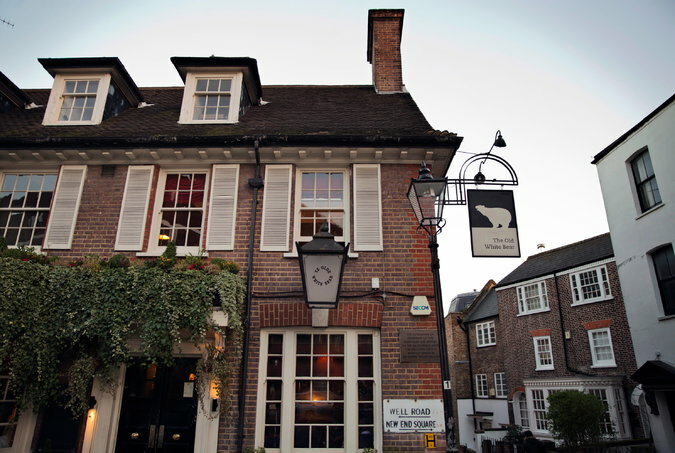 One battleground here in Hampstead is at the Old White Bear. A handsome, two-chimney building of red brick, the Bear has occupied its spot on Well Road for three centuries. Peter O’Toole, it is said, had to be carried out occasionally in his younger, wilder days. Elizabeth Taylor, who was born in Hampstead, and Richard Burton, who owned a home here, were also visitors, patrons say. Recent guests are said to include Boy George and Liam Gallagher. But after the Old White Bear was bought by a group of developers through a company on the Isle of Man, 2,000 people signed a petition to save the pub. The Bear has been declared an asset of community value, and the local council has so far refused permission to turn it into a six-bedroom house. Even so, the pub closed on Feb. 2. With the developers determined to fight, the Bear’s future is uncertain. So Many #Salisbury pubs closing - Why was Labour not supported? What can be done to save our pubs?